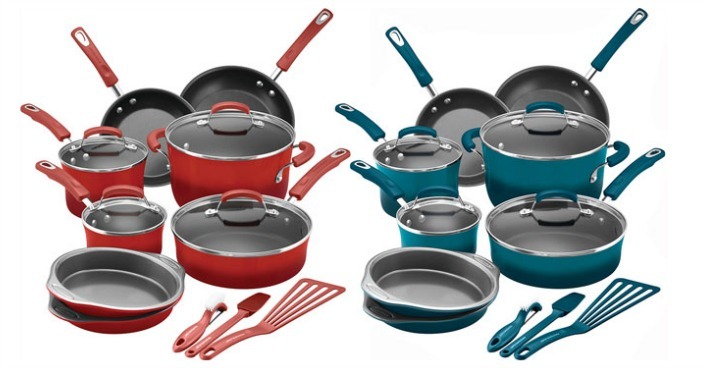 Rachael Ray 15-Piece Nonstick Cookware Set Just $99.99! Down From $290! You are here: Home / Great Deals / Rachael Ray 15-Piece Nonstick Cookware Set Just $99.99! Down From $290! Right now you can get this Rachael Ray 15-Piece Nonstick Cookware Set for just $99.99 (Reg. $200) at Walmart! Cooks new and experienced alike will appreciate the essential pieces included in the Rachael Ray 15-Piece Hard Enamel Nonstick Cookware Set. Whether you’re simmering and searing or browning and baking, Rachael Ray cookware has you covered. From the reliable cooking performance to the fun, contemporary colors and durable materials, the pots and pans in this collection can handle everyone’s favorite dishes and then some. Sturdy aluminum construction promotes even heating, helping to reduce hot spots that can burn foods, and the bold two-tone enamel cookware exteriors show plenty of stylish kitchen personality.